This Cheeseburger Soup is my favorite soup on the blog. It is also very popular and gets rave reviews every single time. I don’t think I have ever had a bad comment about this delicious soup. But I do get a lot of comments asking me if it can be made in the slow cooker. I had to test it our for myself! Me and my slow cooker are BFF’s. Especially when it is busy around the holidays. Who am I kidding. It is always busy. That is why I love using my slow cooker year round. It was so nice to just throw all of the veggies and potatoes in this soup right in the slow cooker. 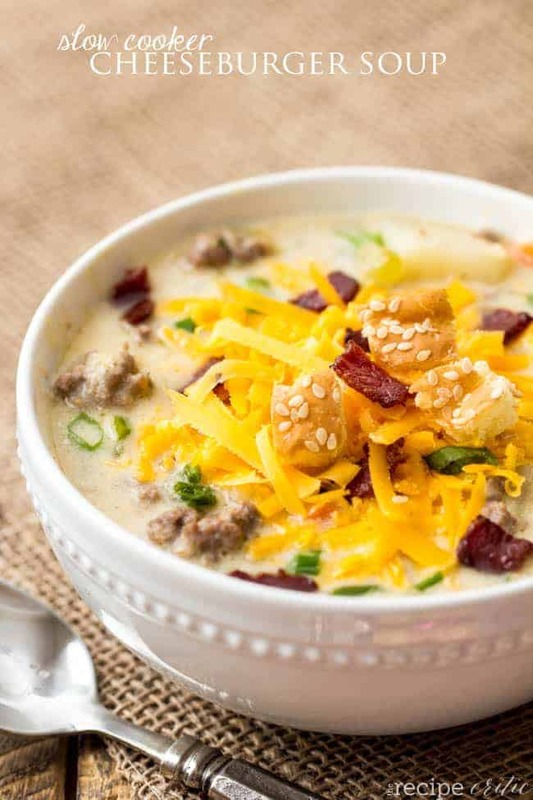 Let it cook all day and have a delicious hearty cheeseburger soup for dinner. This soup was just as incredible in the slow cooker. And I love making it because I am reminded why this soup is so good! All of the goodness of a cheeseburger is packed right inside this soup and it is incredible. Whether you make it in the slow cooker or on the stovetop, you have to experience all of the goodness of this soup for yourself! All of the goodness of a cheeseburger packed into an amazing hearty soup! This is definitely my favorite soup I’ve tried off your blog. Now that I can use my slow cooker? Yay! I still need to make your zuppa toscana soup. It’s been calling my name! Can you use turkey burger and still get just as good of flavor? First – I love your reading your blog and making your recipes. I was wondering if you could make this soup without the crockpot? Any advise would be helpful. I made this for dinner tonight. I used elk in place of the beef and I left out the carrots because I didn’t have any. But my husband said it was one of his favorite things I have made! Thanks for the great recipe. I will definitely make this again. I noticed you didn’t use velveeta in this crockpot version. Do you think it would still work with velveeta? I was kind of excited to use velveeta since I haven’t had it since childhood! If I doubled the recipe and use half cheddar half velveeta, do you think it would be ok in the crockpot? Thank you! This was absolutely delicious. My husband went back for THIRDS! I think next time I make it, I may swap the cheddar out for a mix with maybe Swiss cheese for a different flavor! Tried this one yesterday. Superb recipe! Perfect as is. I made the recipe today and my girls loved it! I doubled the recipe for our big family and didn’t have enough shredded cheddar so I added about a cup of velveeta and it was delicious! The cheese was a little creamier than I think it would have been. Thanks for an easy way to make a great meal tonight! I was wondering what size crock pot you used? I’m making this right now and it’s not quite half full. Since it should always be at least half full for even cooking I’m just wondering (for next time) if you used a smaller one than mine which is 6 quarts. I’d love to know what size you use on all of your recipes! 🙂 Thanks in advance. Great recipe! Why is the butter divided? In the original stovetop recipe 1 tablespoon of the butter was used to saute the vegetables. I guess in the Crock-Pot version you’re just going to take it down to three tablespoons for the roux. Made this today on a very cold day when our furnace had gone out, perfect for a cold day and filling. I will definitely make again! WONDERING HOW TO DO THIS IN THE INSTANT POT?? THE CHEESEBURGER SOUP.